Kathy Freston is a New York Times bestselling author four times over; her works include The Lean, Veganist, and Quantum Wellness. 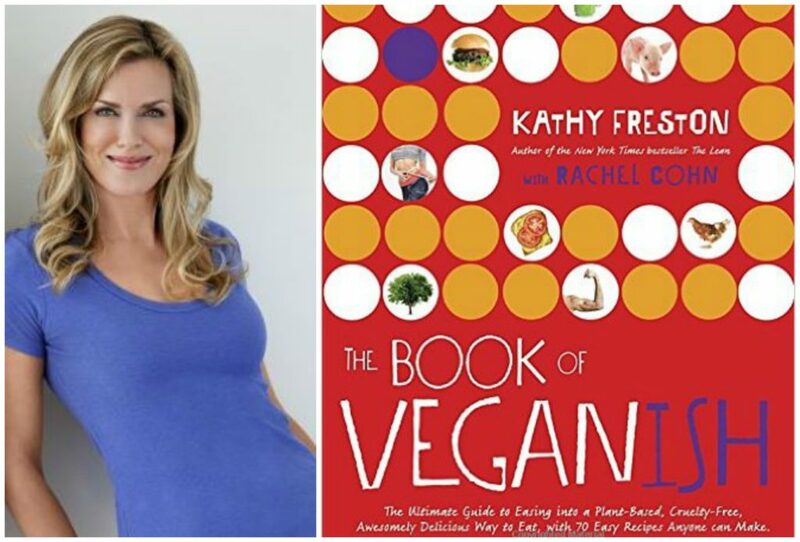 Hi, Kathy, I’m super excited about your new book The Book of Veganish! Tell me what inspired you to write it. I wrote this book with Rachel [Cohn] because we were having coffee one day, and realized that there’s so much more to going plant-based than just deciding not to eat animals. How do you date (or marry) someone who is not on the same page as you; what do you say when someone makes fun of you, or taunts you for not being 100% perfect and pure; how do you make food that’s fast and friendly and hearty; what are the perfect swaps for eggs or protein? So many questions a beginner struggles with… and we wanted to put it all in one place so that the guidebook is simple to use – like having a companion on the journey who is showing the way. Plus, we wanted to offer super-easy, delicious recipes that had beautiful, color photos to go along with them so the reader could see what plant-based food looks like. It’s a less intimidating shift that way! It’s for socially conscious young adults (and the young at heart!) who know they want to move away from eating animals, but just need some help on figuring out nutrition, social situations, and how to make seriously easy, fulfilling food. A stunning 48% of young adults want to eat a diet without meat, so the book is a tool for advocacy. It’s a gift for those already on board to give to their friends or family who are curious but have no idea how to start. There are tons of vegan books out there. What makes this one different? The Book of Veganish speaks directly to young adults – those aged 18 to 25. That’s a hugely important sector of the population that could use some support. A few things about Generation Z that sets them apart: They don’t tend to like labels (i.e “vegan”); they’re more fluid with how they identify themselves; they aren’t tied to the 3-meals per day program; they snack and eat at odd hours, not needing an official “lunch” or “dinner”; they are mistrustful of government and corporations, so they go with their instincts and personal experiences more; and they want more than anything to lead meaningful lives that will make a difference. I respect these people enormously; they are smart and aware, and they are the ones who are just about to go out into the world and start businesses and families, so it’s really important to empower them with what they’ll need in order to be successful with a plant-based lifestyle. Our future – the future of the animals – is in their hands. Is being veganish easy or is something that only certain people should try? Veganish allows the curious to find his or her way comfortably and in their own time. I’m really glad that I eased into this way of eating gradually, because it stuck. If I had to get it right all at once, I would have quit and gone back to the foods I grew up with. If we want people to succeed and thrive, we have to give them the space to find their footing. What should someone do if they slip and fall off the vegan wagon? I know a lot of people feel bad and give up. I hear all the time, “I like the idea of being vegan, but I could never give up cheese fries.” Or Greek yogurt. Or sushi. So I say, “Enjoy the fries; have the yogurt; go for sushi; and just stay awake and aware.” Show yourself some love and you’ll figure it out. Eventually you realize that you don’t miss much of anything, and you feel so good that those old foods become a non-issue. Is it easier for younger people to go veganish or can you teach an old dog new tricks? Well, very motivated old dogs certainly can learn. But after a pattern is well worn into the grooves of our psyche for decades, those daily habits are harder to break. Veganish makes the shift less jarring, more do-able. [Young adults], on the other hand, are just figuring out who they are so it’s a lot easier for them to set some good habits. Do you feel hopeful that things will change and people will finally understand that what we do to animals is just wrong? I am not only hopeful, I’m excited. Read the testimonials and tips from the kids and people we feature in the book; you’ll see that the future is already unfolding in an unbelievably good direction. What are some of your favorite parts of the book and you feel are the things that can easily get people on the road to Veganish? I love the quickie tips for snacks and foods that [young adults] have come up with that are protein-packed and can travel easily. I also love the easy-to-navigate charts on what to eat and how to swap things out for better choices. What should people know about Farm Sanctuary? Farm Sanctuary is the only organization of its size where you get to experience – really experience – what animal advocacy is all about. We’re reminded of why we care, and why we need to care more. You can look into their eyes and connect with these animals, feel who they are as individuals. You see up close their quirky sweet personalities, so your commitment comes alive. The flame in your heart is fanned by their proximity, their absolute vulnerability. There is no better advocacy then knowing whom you’re advocating for. What’s next for you? Any exciting new projects you can talk about? Well, I love fashion. And I love helping businesses that are devoted to replacing animal products. So you’ll likely see me associated with any of those things in some form or another…. This is the first column of “Book Barn” with Farm Sanctuary Board Member James Costa. An ardent animal activist and a regular contributor to Litbreaker Media, James is the director of the documentary Lunch Hour, which looks critically at childhood obesity and school lunch programs. Currently, James is working on a new documentary about Native Americans and diet. This entry was posted in author, book, Book Barn, vegan and tagged Activism, cooking, food, nutrition, vegan by Farm Sanctuary. Bookmark the permalink.